We are a Colorado Springs, Colorado based free community “swap” inspired by similar groups around the country. We are passionate about building community around the Pikes Peak region, meeting like-minded people, and learning from one another through swapping homemade food and goods in a social setting. 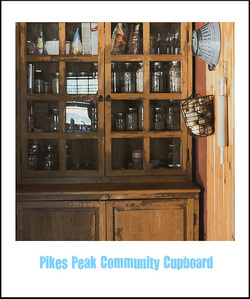 Pikes Peak Community Cupboard hopes to inspire people to be a part of the community more as there is a need for that these days. We are truly committed to having events that are powered by generosity and good will. We hope to see you at one of our events!